Greetings Sonic fans! Faster than a speeding storyline, more powerful (and less confusing) than an MLA Handbook, able to leap small paragraphs and badly written dialogue in a single bound! Superfan! Born on Planet Earth, Daniel J. Drazen - a mild-mannered librarian from a friendly metropolitan college - fights for truth, justice, and the Sonic fan way! Respected by all the fandom, the eldest of the group and an all-around cool, well spoken dude to boot Dan Drazen cranks out fanfiction, and reviews of the books we read every month in a timely fashion. MR. DRAZEN: Well, I'm one of the senior members on the list. (Referring to the Archie Sonic Mailing list -WB) I was born December 29, 1951. I have a twin brother, Patrick, and a younger brother, Timm, who died of smoking-related cancer last year. My parents also died early, in their 50's. I grew up in Berwyn, Illinois, a city just west of duh great city uh Chicaguh (as the legendary Mayor Daley used to say). I attended Andrews University in Michigan and got my B.A. in theology; it was there that I also met and fell in love with my wife, Nancy. We've been married 23 years last February. I also have a Master's degree in Library Science from what is now Dominican University in River Forest, Illinois, but back then it was Rosary College. SHQ: We had heard that you were a teacher/professor in college? What is it that you teach and what drew you to your profession? MR. DRAZEN: I'm on the Andrews University faculty, but not on the teaching faculty. Librarians have faculty rank here. I'm the editor of the Seventh-day Adventist Periodical Index. Basically, that means I get to read magazines for a living. Is that cool or what!? There are about 45 titles published by the church that I read and index, then I enter the information about the articles into a database. The work suits me, though most other people would find it about as interesting as watching paint dry. MR. DRAZEN: I started taping some of the SatAM TV shows back in September 1993 so I could keep up with the conversation on the rec.arts.animation newsgroup. Before I saw it I was inclined to dismiss "Sonic" as just another half-hour commercial for Sega until I actually saw some of the eps. I loved everything about it at once: the writing, the art, the characterizations, the voice work. I was hooked. I'm pretty hopeless when it comes to the games themselves. SHQ: In becoming a fan of Sonic, has there been a particular video game, comic book issue, or cartoon episode that has become your favorite? And if so why? MR. DRAZEN: Like I said, it wasn't because of the games. WRT StH, there were a couple of first season eps that really tipped it in for me: "Sonic and Sally," where Tails realizes that they're dealing with a robotic Sally, and "Sonic's Nightmare," where Sonic gets to do more than spout hip-cool jargon. 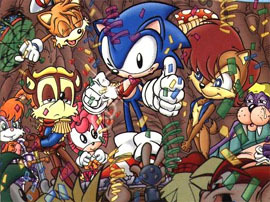 As for the comic, I didn't know there WAS a Sonic comic until I saw the cover for #18 and its picture of Sonic and Sally about to get married (!). That was the hook, but what kept me was the quality of the writing for "In The Still of The Night" by Kanterovich and Penders. The death of Julayla in that story was handled extraordinarily well, with intelligence and sensitivity. Unfortunately, the writing in the book has seldom, if ever, scaled those heights again. But I keep hoping. SHQ: Can you give us some feedback on how you had, at one time, been "the official reviewer" for the Archie comics? How did you get that monicker and what happened? MR. DRAZEN: At first I simply wanted to put together a Sonic FAQ file, the remnants of which are on display as part of my Sonic Web site. Somehow or other, I started doing full-blown reviews, and I've been doing them ever since. I've actually gotten e-mail from people telling me that the reviews are more entertaining than some of the comics! Which says more about the comics, I think, than about my skills as a writer. WHO got the idea that I could do reviews for the Archie Web site, I'll never know. But one day Fred Gabrie called me to ask if I'd do it. I ended up doing three or so (for Sonic 55, the Return of The King special, and Knuckles 11, as I recall). I tried to keep my flaming tendencies in check, but after three months Fred decided to cancel the deal. Just as well; no way could I have avoided massively flaming S56's "Immortality Is Forever." And as I understand it, aside from Fan Art updates, the Sonic part of the Archie comics site has pretty much languished since the departure of Paul Castiglia. SHQ: Of all the things you do - you're most known for you reviews of the book and your fanfiction. Every month, never failing, you pitch out a review of the comic book. What drives you to keep going? Why do you still read it? Do you believe that your reviews have impact upon the Sonic community? Why so? MR. DRAZEN: There's a part of me that wants to believe that someone in Mamaroneck reads these things and possibly takes them to heart. I know that Archie wants feedback, but a lot of the letters they get probably don't say more than "That was kewl!" or "That sucked!" without spelling out WHY. I have sufficient mileage to be able to articulate WHY a story or arc or artwork worked or didn't, and I like to think that at some point the creatives will take a cue from that and make the book all that it could be. After something like "Endgame," though, I wonder if it isn't just an exercise in talking to myself. SHQ: Have the writers and artists ever given you feedback on a review? Do you think that some of the higher ups at Archie still read them? MR. DRAZEN: Yes, but sometimes not in a good way. There are times I've gone off half-cocked and Ken or someone would have to set me straight. That happened when I asked out loud whether there was any such thing as "quality control" at Archie that would have prevented the Death Egg #2 disaster. Paul Castiglia let me know in no uncertain terms that it was the Canadian printer that screwed up by oversaturating the reds on certain pages of the issue and making the thing look like it was printed with a mixture of ink and mud. Generally, nobody's gotten back to me and said "That's a great idea!" Though the fact that they put out a "director's cut" of the final installment of "Endgame"(which I had tossed off as a suggestion in my review of S49) tells you that maybe I come up with SOME good ideas but I should never expect Archie to acknowledge them. The creatives are more likely to rebut certain points than anything else. Ken Penders has been very generous with his time in keeping me informed and occasionally throwing a spoiler or two my way, and I appreciate that. MR. DRAZEN: First off, I'd make sure that there IS a long-term plan. Archie's been keeping the creatives on a short leash, according to Ken's last chat session. They maybe know what's going to happen six months in advance, tops. Then, too, I don't get a sense of coordination of the story elements between Ken and Karl Bollers. The editor's position, as I understand Justin Gabrie's description of it, has more to do with making sure the comic gets produced than with making sure the content is solid. That explains why Justin made such a bonehead statement about Sally being 5 years younger than Elias when it was obvious they were closer in age. So that would be Job 1: institute more editorial oversight to guarantee tighter continuity and consistency. Second, I'd keep Sega out of the loop as much as possible. The writers mostly know what they're doing when provided with the tools. Sega's interference in stories and characterizations, however, have hurt more than helped. Maybe with Justin Gabrie working in the belly of the beast on the Sega payroll, he'll cut the creatives more slack and let them put out a better book. That's not to say that Sega would never be consulted. On the contrary, their input as to the back story of the Sonic Adventure game could possibly have redeemed that story arc. As it was, Ken and Karl only had Spaz's game-play notes to go with (until close to the end) and stumbled around seeing what would work (such as the whole Mysterious Cat Country plot line, which pretty much went nowhere). If I'd been told that Archie's creatives couldn't have access to the English game script I'd have simply told Sega: "Fine. You'll have your adaptation in about two years, because that's how long it's gonna take to figure out the story on our own once the American game comes out on the market." Third, I'd want to plan AT LEAST a year in advance where the story angles are going and how they're getting there. Keeping the writers on a short leash just feeds the sense that they're making it up as they go and they have no real feel for the characters as a result. Finally, I'm not saying I want to be the SOLE writer, but I'd like to be able to have more say in the characterizations. I want to see the book get away from the "dead behind the eyes" treatment of these characters. The fans are devoted to Sonic, Sally, Tails et al. because they believe that these characters DO have personalities, emotions, aspirations. The writers should appreciate that and go with it, even at the risk of losing some of the younger readers. Heck, a GOOD writer will still figure out a way to bring them along without reducing the characters to cardboard cutouts. SHQ: Many people have pretty much agreed that your fanfiction is some of the BEST on the Sonic internet. This brings out a question that you've probably heard NUMEROUS times - WHY have you never tried to apply for a writing position at Archie Comics? MR. DRAZEN: Archie's made it clear that they only talk to other comic book writers, those who have already worked in the profession. Believe me, if they accepted stuff thrown in over the transom (as they say in freelancing) I'd have sent them stuff long ago. My only real hope of even being noticed by Archie is to make a success of my serious fiction (a book I'm in the process of writing now; see below). They still may balk, though, because I'm not a COMIC BOOK writer! That IMHO is a sin and a shame. I think of myself as a writer who is capable of doing comic books; to call myself a comic book writer is too confining. But the short answer is, I don't expect them to be contacting me any time soon, especially with the market as soft as it is. SHQ: Would you decline the offer if you were accepted? Why? MR. DRAZEN: No way! I love writing, whether the reviews, the fanfic, whatever! I'm not going to pass up the chance to get paid for it. Besides, they tend to engage writers on a freelance basis, so it means I wouldn't have to quit my day job. MR. DRAZEN: What Sega has failed to realize is that ever since the SatAM series, the characters have left the nest, cut Mama Sega's apron strings, and have begun to make lives of their own. The relationship between Sonic and Sally is a case in point. After killing off Sally, Ken Penders had planned on turning Sonic into yet one more cliched ronin, one more comic book loner trying to follow some ill-defined path or other like an aimless Jedi apprentice. Big mistake! Huge!! Whether Ken or Sega like it or not, Sally is a part of Sonic's life and vice versa. If they're going to screw with the continuity as it now stands, they'd better have a good reason. And from what I've seen, that's something the creatives and management have very little of. This is not to say that we can have them do just anything. It wouldn't do having Sonic drinking or fornicating with abandon, in violation of the Code. Then again, Dan Slott (in Special #13) set it up so that Sonic would have to take a life! And Sega apparently bought into it!! So maybe even Sega doesn't know what to do with Sonic outside of the game grid. SHQ: Do you think the Sonic Adventure influence on the book has it hurt or helped it? What are your views on the SA adaption so far and how it has been handled? MR. DRAZEN: Sadly, the greatest influence of Sonic Adventure has been in the area of character design. It appears that Archie isn't programmed to receive the narrative element. Tikal (and they have a hard enough time agreeing on the spelling of her name, which ought to tell you something!) was given the "positive feelings" dialogue instead of Tails, so it's as if the writers are studiously avoiding letting any of the regulars have anything like insight. Then again, Ken and Karl have been working under the handicap of going mainly by the action of the Japanese version with no clue as to the characters' motivation. So it's been like reviewing a movie with no sound; you're missing something there. I'm afraid that the influence of SA won't extend beyond the superficial, even though there's a good idea or two in there somewhere. After all, they pretty much misread the significance of what happened to Tikal and the Chao. SHQ: How do you feel about the direction the Sonic comic is now taking, with the return of Robotnik and the re-establishment of the premise of a group of underdogs operating out of Knothole to defeat him? MR. DRAZEN: It actually needs to be played up more. That situation is so broad, with so many possibilities, that the writers should be able to get good traction, particularly if the stories are also opportunities to deal with the characters as well as the immediate situation. 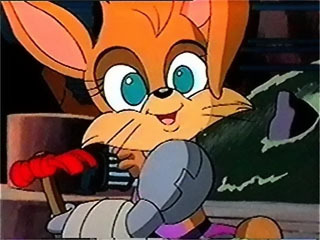 SHQ: Do you think the non-Sega characters from SatAM should be "untouchable" in the comic (e.g., not killed or roboticized)? Why or why not? MR. DRAZEN: The original ensemble should be kept together, yes. They simply work well together as a team. In a recent Sonic-Gram, Justin compared Sonic to a sun around which other planets (i.e., secondary characters) revolve. It's much more complex of a dance than that. 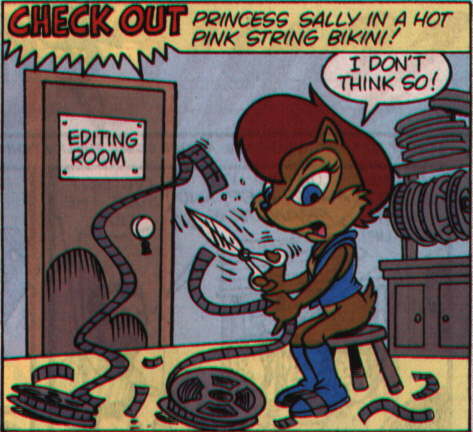 Sally is affected by Sonic, and vice versa. Bunnie and Antoine are officially an item. There's still a LOT of room to expand on the relationship between Sonic and Tails. It would be more accurate to say that they're the protons at the nucleus of an atom with everybody else as electrons on the outer rim. Besides, killing off a character is IMHO an admission of defeat by a writer, an admission that they've run out of ideas WRT that character and just want to get rid of them because they're a nuisance. That's why the "death" of Lupe left such a bad taste in my mouth. SHQ: Mike Gallagher roboticised Sonic and Knuckles and set off Robotropolis with a nuclear warhead. Karl Bollers sent Sonic and Tails on a world tour after a gremlin named Ixis Naugus and a plot device named Nate Morgan. Ken Penders tried to kill Sally to no avail, so he killed Robotnik instead. Sonic Adventure came along and the artwork and story took on a more stylized look to fit that of the Dreamcast game. What did you think about these specific eras of the comic? Were they good or bad? How could they have been done better in your opinion? Do you like this new "stylization" and did you consider any of these as a breath of fresh air in terms of creativity and writing? MR. DRAZEN: Gallagher: Again, this was a symptom of a lack of editorial direction. What he did was valid plotwise, but it had about as much consequence as a character getting conked by an anvil in a Warner Brothers cartoon! It just wasn't serious writing. I know Gallagher is capable of doing serious stuff from his recent "Sonic Kids" stories, but this was simply bad writing IMHO. The Round The World Tour: This was Archie's chance to showcase Sonic and Tails away from the Freedom Fighters, and the creatives squandered it. The book simply wasn't that interesting, at least not as interesting as it could have been. Part of that was due to internal problems beyond Archie's control: about that time Nelson Ortega said "Sorry, I'm outta here" so Archie had to scramble to cover the disruption in their schedule. But it became clear to me that Sonic and Tails couldn't carry a comic book all by themselves; they NEEDED the rest of the ensemble cast. Endgame: I honestly don't think Ken thought through the ramifications of killing off Sally, and what happened to what was supposed to be his "masterpiece" was tragic (for a writer) but also carried a certain poetic justice in that what had been a powerful if controversial idea turned into a dogpile. Robotnik Redux: Yet one more triumph of style over substance. Apart from bringing the continuity in line with Sega's product there was no real reason to make the changes that SA required. In short, these strike me as individual ideas that could have been better executed rather than elements in a carefully-considered development of the story. They're making it up as they go, in other words. Some of the ideas Ken has thrown into the mix (Elias, the fate of Queen Alicia) are actually far more compelling and can be even more so if the writers ever get around to developing them under the influence of some coherent editorial direction. The writers are just floundering now, grabbing onto anything that'll float. SHQ: A lot of people have referred to Nate Morgan as the "Bill Cosby of the Sonic Comics Universe". What are your flat out honest views on Karl Bollers' "Nate Morgan"? Do you believe he is a duex ex machina or a self insertion character? MR. DRAZEN: Nate's introduction was mishandled from the get-go. He was never that tragic a figure as the original story arc wanted him to be; that's why he probably should have bought the farm instead of Eddy the Yeti. Now he spends his days as a walking plot device with nothing going on behind the eyes. If he IS a self-insertion character, it's a tacit admission that Karl Bollers is a boring guy! I'm still convinced that the real reason he was thrown in was to try and soften the notion that this is, at heart, a furry book. The character has added no complexity to the story or its characters, which is hard enough to do when you have no sense of editorial direction to begin with. Sadly, he's been reduced to being the token hyoomon. SHQ: What do you think is the best Sonic comic Archie has ever done? What do you think is the worst? Explain why and compare to the Sonic book of yesterday to the Sonic book of today? In your opinion, what did they do right and what did they do wrong? MR. DRAZEN: Best issue: #18. "Wedding Bell Blues" was a Gallagher romp with a twist and not without a certain amount of charm. I've already expressed my appreciation for "In The Still Of The Night." Worst Issue: the "Battle Royal" special. The cover story was a mindless fight exercise with a heavy dollop of cynicism. "The Map" was Gallagher's attempt to retool Antoine as an action hero, and it failed miserably because not only did it totally misread Antoine's character it didn't even hang on to the few bits about him (any notion of chivalry, for instance) that could have redeemed him. I find it hard to think in terms of individual issues, though, because sometimes the cover story can be a bomb (and not in terms of being "da bomb") while the back story shows signs of intelligence. SHQ: What is your belief on death in the Sonic comics in general? Is it necessary? Has the book become depressing because of the deaths that had taken place? MR. DRAZEN: I was depressed by Sally's "death" at the beginning of "Endgame," because I'd come to care about the character. And Julayla's death was handled well. 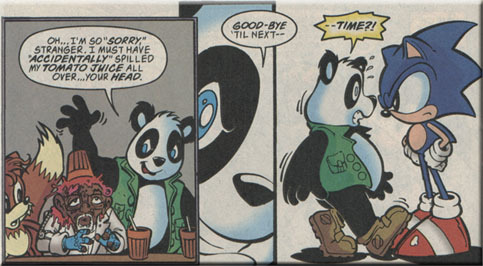 For the most part, though, the deaths of characters have been badly mishandled in the comic. Characters have been snuffed out because the plot called for it (Steppenwolf, Charmy's friend) or for reasons unrevealed to the reader (Lupe). But even in manga and anime, where character deaths happen and may or may not have meaning, there is NEVER a sense that a death has no consequences. Sonic kills someone, and the results? Nothing! That's one of the worst parts about "Zone Wars: Giant Robotno." Sonic took a life and because it happened in an alternate reality it's supposed to be meaningless! Maybe it's a Code thing, I don't know, but the creatives don't have a good track record in this area. SHQ: Of the authors and artists below give your opinion on their run on the Sonic comic. Their ups and downs, good and bads. What is the best and worst thing they have done in terms of the book? MR. DRAZEN: Ken Penders - Ken is a good writer with (of course) his own take on who the characters are and where they should be going. That has been influenced by exposure to other comic book writers -- the work of Eisner, Lee and Kirby. Because he defaults to these writers when plotting necessitates it, the results can be less than satisfying. He needs to accept that the characters he has to work with here can be far more complex than what he's used to, and that he doesn't have to be afraid of that complexity. He's only allowed it to show through on rare occasions, and then mainly with subsidiary characters (Bunnie in "Upgrade," Julie-Su in the "First date" arc) rather than the franchise (Sonic, Tails). That, of course, may be more a function of getting slapped down by Sega than anything else. Mike Gallagher - Like the little girl with the little curl, he can be either VERY good ("Eve of Destruction," "My Secret Guardian") or mind-numbingly horrible ("Some Enchantra Evening," "The Map"). He's capable of far more than jokey little filler stories and has demonstrated a real grasp of the characters. "Opposites Detract" (S59) shows what he's capable of, and even the otherwise deplorable "Outback Gut Check" (S61), with its weak plotting and Barby's creepy romantic interest in Tails, showed that Gallagher has some interesting story ideas by dropping the reference to the bunyip. My only guess is that he, like all the creatives, lacks a sense of editorial direction. Karl Bollers - Needs to become way more familiar with the characters, which are the heart and soul of the book. His ability to survive during the Sonic Adventure adaptation (where he and Ken mainly had the notes of the gameplay from the Japanese version to fall back on) demonstrates that he can handle action. His painful weakness, however, is his vanishing ability to make the reader care about Sonic and the gang. It shone through in "Running To Stand Still" (S54) whereupon it appears to have been smothered to death by the management. Patrick Spaziante - Top-notch sense of design, even if his page layouts are a little non-linear at times. But I applaud his audacity. James Fry - The anime/manga influence comes through, and I have NO problem with that! He's been a welcome addition. My biggest complaint is that he's had to double-team with other artists such as Nelson Ribiero (on "Zone Wars: Giant Robotno," for instance). It's probably a deadline thing. Sam Maxwell - There's still something a little too loose about his style; half the time he makes his characters look like balloon animals, and his minimalist backgrounds give the impression (true or not) of either haste or laziness. It's not fair for me to judge, since I'm no artist myself. His most recent work has improved greatly. SHQ: It's known amongst Sonic fans that you have a particular affinity for Sonic SatAM. What draws you to it more than the others? MR. DRAZEN: Aside from the sheer quality of the art, the writing, the voice work, it took itself seriously enough that it never degenerated into absurdity. It also had a strong premise and the sense to allow the characters to be highlighted as the occasion called for it. It simply worked for me. SHQ: What do you truly feel about Sonic Underground and AoStH? The Queen's voiceover at the beginning of most of the eps. The sibs looking for their mom was supposed to be one of the emotional hooks for the series, but having her introduce each ep pretty much drained the emotional tension out of it. Besides, by the time I saw my first ep I'd already been exposed to the gimmick at the beginnings of each episode of Nelvana's "Franklin" series. I kept expecting to hear Queen Aleena say: "My children could count by twos and tie their shoes...."
Those stupid music videos: Musical numbers, in the wrong hands, are usually an invitation to bring an animated film or TV show to a screeching halt, and SU was no exception. According to Mark Lungo, someone who's spoken to people involved with the series and who sent me a tape of selected eps, a lot of the musical numbers were plugged into the shows because there's been a musical number in the previous ep. It didn't matter if the music was wrong for the occasion, that it might have been upbeat in an ep where a ballad would have been more appropriate, they HAD to throw one in and accompany it with a lot of trick special effects. "Adventures of..." was something else entirely. Making not the slightest attempt to take itself seriously, it careened from joke to joke for the most part. Much of it has faded from memory except for a few bits: Da Bears (I remember that as I'm from Chicago originally); the ep "Tails' New Home" where the relationship between Tails and Sonic is explored along with how they met up; the "Zootropolis" ep, which was totally bizarre and which involved a galactic hunter babe getting the hots for Robotnik (Go figure!). SHQ: Have you ever played the videogames? What do you think of them and the latest Sonic Adventure? MR. DRAZEN: Since getting a PC with enough muscle to handle it, I've been playing the Sonic and Knuckles collection on CD-ROM. I'm pretty miserable at it: I've gotten Sonic to the Flying Battery Zone (where he dies a quick death), and the Marble Garden Zone (where he's been getting crushed as the city collapses). Tails still hasn't got the knack of taking out Robotnik in the Hydrocity Zone, nor can I get Knuckles out of Mushroom Hill or the Carnival Night zones. But Sonic Adventure (which I have NOT played; there's no way I could justify the expense of getting a Dreamcast) at least has more of a back story than the other games which mainly consist of getting from Point A to Point B.
MR. DRAZEN: Yes, but like parents who refuse to admit that their children have grown up they see them merely as game characters and licensed properties rather than as characters that have taken on a life of their own thanks to the SatAM series and fan interest. SHQ: How much influence does Sega have in the comic? Is too much a bad thing? How much influence do you think Archie has on Sega, Sonic wise? Do you think Sega Of America is partly responsible for Sonic's lower popularity today? MR. DRAZEN: IMHO, Sega is being too controlling of a character who could make a solid impression if the creatives had a freer hand. But as long as Sonic is licensed by Sega, Archie can't veto any of Sega's directives. I can only hope that with Justin Gabrie working for them now, he'll be able to intercede and cut the creatives a little more slack. But don't bet cash money on it. SHQ: What initially inspired you to start writing, specifically Sonic? Have you written anything else not Sonic? Has there been anything else, past or present, that has helped to inspire you in writing your stories? MR. DRAZEN: Before Sonic, I'd actually written some Care Bears fanfic. The show was something of a guilty pleasure of mine. It helped me, I think, in that the characters were SO spelled out and so definite that writing for them wasn't too complicated. After all, when you deal with characters with names like Grumpy Bear and Friend Bear, your options are pretty limited. Inspiration, for Sonic or non-Sonic, is one of those intangibles that varies from work to work. I think I saw some fanfic being posted on an old Sonic list and simply thought, "Let me take a crack at it." How the first story, "Bloodlines," evolved exactly I'm not too sure. SHQ: How do you come up with your plot ideas for your fanfiction? MR. DRAZEN: It varies. The inspiration for "First Honor" was a description of a Wiccan rite involving an offering of milk to the Earth Mother Goddess or something. That somehow mutated into my idea for a Mobian Mother's Day ritual, and the rest of the story was built on that. "A Matter of Trust" sprang from a desire to work a badger into the continuity, a badger who ended up being loosely modeled on a Klingon. "Space Case" began with the image of a body being dumped out of one of Robotnik's haulers; at about the same time I discovered a book here in the library that explained epilepsy to children, and the two ideas came together. "Back Upon Itself" was written simply as a reaction to Justin's totally unsatisfactory explanation of the age difference between Sally and Elias. Like I say, it varies. SHQ: One of your most talked about fanfics depicted Sally walking into a meat locker. However, the "hanging meat" wasn't just the typical meat in a freezer. They were actual dead Mobians which put a new spin on the source of Doc Robotnik's weight gain. What inspired the scene for that and why did you add it to the story? Did you feel it pertinent? Impact perhaps? MR. DRAZEN: I may have been a little too influenced by Bill Holbrook's excellent e-strip, "Kevin and Kell," wherein an herbivore is married to a carnivore and the preditor-prey relationship is played up considerably. It may also have something to do with my interest in the Holocaust, which was certainly horrific enough. Or maybe it was a simple matter of my rushing in where angels feared to tred. Since Steve Butler has further fanned the flame in S83 by depicting a meat wagon in one panel, I don't know whether to take credit for it or not. SHQ: This is the time to plug yourself. ^__^ Why should the Sonic fandom read your fanfics? What, in your eyes, makes your fanfiction special? MR. DRAZEN: I like to think it's because I do good work, that I've lived long enough to bring experience (in writing and in real life) to my work that most other fans (being teenagers or thereabouts) simply don't have. It's sort of my way of saying: "It's OK to like this stuff; you don't have to feel that you've got to outgrow it at some point." Writing it keeps me young in some respects. SHQ: "Mobius Apocalypse" depicted what would be a possible "final days of Knothole". Bunnie was "disconnected", Antoine died a hero's death saving Tails, Knuckles pretty much went insane at one point, and virtually every character was put through the wringer 10 times over with only ONE FF left at the end. What inspired this story and why did you write it? MR. DRAZEN: I don't know WHAT I was thinking! Except possibly that I thought that I couldn't keep this up forever. So I asked myself: "If I had to wrap this whole thing up once and for all, what would happen?" My basic conclusion was that someone would somehow have to hit the Cosmic Reset Button, and that's what the story basically accomplished: it set up the possibility of a world where Robotnik had never made the scene. I've actually gotten some heat for that ending from one fan who insists that the characters wouldn't be who they are had they not gone through whatever they did to bring them to the "present." I can see his point, and like I said there are moments when I have to wonder why I went ahead with it. SHQ: You have a "thing" for Bunnie - don'tcha? ^___^ Another fanfic, "When A Bunnie Meets A Bunnie" depicted Evil Sonic's Anti-Mobius in a manner never seen before in the comics. In fact the concept of "The Anti-Bunnie" had never been seen there at all. Why do you think Archie avoids it and what was your inspiration for her? SHQ: What do you think about the new comics on Team Artail based on your stories? Do you have any input into the creation of those, aside from the story itself? MR. DRAZEN: It's a little humbling to see my stories being illustrated by others. I've never had reason to consult with or direct the artists; they're doing their thing as I did mine. Sometimes I find myself wondering if working on these comics keeps them from having a life; other times I'm surprised that I wrote something that good! SHQ: In terms of your fanfiction, what do you feel has been your best produced work and your worst produced work? MR. DRAZEN: The best I'd have to say was "Capture The Flag." It was certainly the most fun, because Archie hadn't written any Sonic Kids stories by that point and I was sort of blazing the trail. And I couldn't rely on new characters to get me out of any jams. The worst would be "The Body In Question" because the idea for that one came from an outside source. I think I did all right by it, but it didn't come from the heart. SHQ: How much re-writing do you do on the average story? What length of a story do you recommend for the general reading public? MR. DRAZEN: ALWAYS assume that there will be rewriting; not even the great writers get it right the first time. Up to one-third of your material will probably be revised before you're done. I always print out a rough draft and re-do it until I'm satisfied. A good story length is between 12 and 20 pages, more if you really need to go there. "Runaway" was exceptional as that weighed in at over 90 pages when it was done; that was more of a Sonic novella than a short story. SHQ: What do you think of Sonic fanfiction in general (not yours)? MR. DRAZEN: Given that the writers are mainly students and just starting out, I recognize that they need to be cut some slack. While their outlook isn't mine (nor could it hope to be) I'm glad that they're writing at all! Some stories try to be great and succeed; others need a lot of work. I usually tend to look past what I call the "mechanical errors" (spelling, punctuation, like that) at the story itself. That's what an editor does, really. SHQ: What are your views between where the Sonic comic has been - i.e Moving away from The Sonic SatAM Cartoon continuity to its own continuity set up by Mr. Bollers and Mr. Penders? Why do you think that Sonic fans (well, at least half of them anyway) show so much animosity at major changes that deviate from the original SatAM Storyline while the other half want more Japanese Segasonic influence? MR. DRAZEN: The fans wouldn't be upset if the creatives managed to give them product that knocked their socks off. Archie can move away from the SatAM continuity all they want so long as the place they're going TO is worth the effort. And since there appears to be no clear idea as to where the book IS going, why bother making the trip? Better to stay with the SatAM continuity and try to get it right. MR. DRAZEN: The SA Robotnik actually looks slightly comic compared to the Classic (SatAM) Robotnik. In that regard, it's hard to take him seriously as a villain, which is where the old-style Robotnik had the advantage. Of course the AoStH Robotnik looked like a buffoon version of the old Robotnik and makes the SA Robotnik look good by comparison. On the whole, the SatAM Robotnik looks more like a villain to be reckoned with. SHQ: Do you think the Sonic fandom - internet fandom specifically - helps or hinders the process and longevity of the comics? In your opinion - how much voice does the Sonic Internet fandom really have? MR. DRAZEN: It's hard to tell what percentage of the sales are attributable to Net fans. We're still considered to be a minority of the book's client base in terms of numbers, though I like to think that the broader RL audience will be more likely to grow out of the book and to abandon it as a childish thing before the Net fans do. My fear is that because a kid audience is so easy to please, that gives the creatives license to keep their expectations low. I'm also afraid that the Bottom Line trumps all other considerations. MR. DRAZEN: The best experience was the good reception of "Bloodlines." It told me I was on to something here. The worst has been dealing with mindless flames sent by pro-Mario trolls. SHQ: Who were some of your favorite writers that you looked up to? How have they influenced you? MR. DRAZEN: Richard Adams' "Watership Down" was a pivotal book for me; probably the greatest furry novel of all time. Tom Wolfe's "The Right Stuff," even though it was nonfiction, was more compelling than a lot of contemporary fiction. C. S. Lewis's Chronicles of Narnia were very influential to me in my college years I literally couldn't put down the final book in the series, "The Last Battle," until I'd finished it. When I was in grade school I was very much into Edgar Allen Poe, back before they called it "Goth." But I think the writer that had the most impact on me was the American humorist and cartoonist, James Thurber. His work was excellent, insightful, entertaining. Here's one sentence from his story "The Night The Bed Fell": "Old Aunt Melissa Beall, who could whistle like a man with two fingers in her mouth, suffered under the premonition that she was destined to die on South High Street, since she'd been born on South High Street and married on South High Street." That's one of the most marvelous sentences in all of American literature! It says so much about the character of Thurber's aunt; it's absolutely perfect. From Thurber I learned what writing could be. SHQ: What basic advice would you give a young writer? MR. DRAZEN: Read. Everything! Fiction, non-fiction, whatever. Don't just read other comics, either. I like to think that one of the reasons my fanfics work is that I'm not thinking of writing a comic but a serious piece of fiction instead. Pay attention to all those boring grammar and language rules in high school: use them as tools to help yourself communicate. And actually write something. If you think it's good enough, check out the latest "Writer's Market" at the library and see if you can't get it published somewhere. Even if it's rejected, use the experience to sharpen your craft. MR. DRAZEN: Sometimes it's NOT fun, especially when you're proofreading your copy for the 20th time and it starts to get old. For me, the biggest kick is the surprise in the act of writing: starting to type something the way you've thought it out and then realizing "Wait a second: doing B would work better than doing A here!" It's watching the story grow and open up before your eyes, in ways you may not have expected. That's a kick. SHQ: What do you consider your biggest positives/strengths and negatives/weaknesses in your writing? Do you feel that you can improve - if so how? What fields do you think you don't need to improve on? MR. DRAZEN: My strength is my age and experience. I think I can do more with a story than simply adapt Sonic and Tails to the action of the latest movie, simply because I've seen more in the course of my 48 years than most other fans. I sometimes think that my characters lack subtlety and I should probably work on that. SHQ: What are your future plans for your career? We had heard from you a while ago that you were in the process of writing a book? What is it called and whats it about? MR. DRAZEN: The book, called "One Small Light," is basically about the relationship between a very young boy and a very old man. It's based on the first three chapters of the First Book of Samuel from the Bible, wherein the prophet Samuel, at age 4 (according to the historian Josephus), is left in the care of the 90-year-old High Priest Eli. It's a historical novel which also serves as a vehicle to teach the reader something about the Judaism of 3,000 years ago as well as life during the Late Bronze Period. Right now the rough draft of the book is in the hands of a publisher; they should be determining its fate some time in late October. SHQ: What do you think about the Knuckles comic dying? MR. DRAZEN: "Rugrats" is a hot show now, and it has been for a couple years, but the fact is that it premiered in 1991. Nickelodeon was willing to stand by it until it became an "overnight sensation." The lack of that kind of commitment to both Sonic and Knuckles killed the Knuckles book and could very well kill the Sonic book one day. Management, at Archie and Sega, has to loosen up and give the creatives permission to do their best. Instead, they cut what they perceived to be their losses at the first opportunity. That's what killed the Knuckles book, and it was a crime. "Julie-Xu: Warrior Echidna": In a time of gods and heroes and bitchin' leather outfits.... I've been planning to do a Xena parody starring Julie-Su for some time, but the show itself has gotten SO anachronistic of late it's in danger of parodying itself. Untitled: The Forbidden Zone Arc (K19-21) is one of my all-time favorites, and it inspires this account of the young Elias arriving at the Summersby's doorstep and how they get along. In the beginning, they don't. My working on "One Small Light" may have had more than a little influence on the premise. SHQ: Has your work or Sonic changed you in any way? How have you evolved as a writer, a teacher, and a person because of it? MR. DRAZEN: It's allowed me to actually have a hobby, and to admit to myself that I can legitimately enjoy something ostensibly aimed at a younger demographic. As a faculty member, I've had to discipline myself not to write reviews and fanfic on company time. SHQ: If you had the choice to be in any other career, what would it be? SHQ: Who is your favorite Freedom Fighter? MR. DRAZEN: Ultimately, Sally. She's smart, cool, level-headed. But it's a toss-up between her and Bunnie. SHQ: And finally - What kind of challenge would you like to pursue now? And what is your greatest achievement in the field of work you're in? MR. DRAZEN: My job is really kind of dead end, but I've no desire to do anything else just yet. I hope the book takes off, though I don't expect it to be HUGE in the manner of Steven King or J. K. Rowling. If I become a name within the denomination and get to tour camp meetings during the summer, that'll be enough for the moment. Favorite Films: Casablanca; The Blues Brothers; Raiders of the Lost Ark; The Last Unicorn; 2001; The Shining (when I'm in a creepy mood); Kiki's Delivery Service; Karate Kid II. Favorite Singers And Music: Anything by the Beatles, almost anything by the Beach Boys including "Kokomo," hippie music [Scott McKenzie's "San Francisco," The Youngbloods' "Get Together"], any cut off the Grateful Dead's "American Beauty," Elton John, and IMHO the most beautiful sad song ever, Stevie Ray Vaughn's cover of "Little Wing" by Jimi Hendrix because BOTH of those gentlemen are no longer with us. Lately I've found myself getting into reggae. Favorite TV: "Law & Order," "ER," "M*A*S*H" reruns (because they were so well-written), "Powerpuff Girls," and C-SPAN's "Washington Journal." The last one represents one of the last bastions of political kookery on television as people phone in and state their political case. One of the defining moments on that show during the Clinton Impeachment affair was when a woman called in and fervently declared that "Jesus Christ will remove Bill Clinton from office." Obviously, the Lord had better things to do. Favorite Books: Watership Down, The Right Stuff, Harry Potter and the Sorcerer's Stone, The Chronicles of Narnia, any of the "Straight Dope" books by Cecil Adams, "The Guide of the Perplexed" by Moses ben Maimon aka Maimonides. MR. DRAZEN: Congrats, people. Sega may own Sonic and Tails, but it's the fans that keep him alive in our fanfic, our Web sites, our imagination. Thanks for doing your bit, and Happy Anniversary. Once again we'd like to thank the Mr. Drazen for his time and patience in this interview.